Robert is a famous 18th-century landscape painter from the enlightened France. It so happened that after studying the basics of painting and sculpture at home, the young artist was sent to Rome. 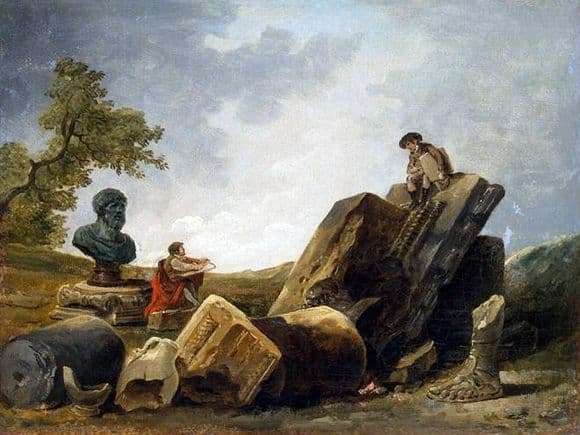 It was Italy that later became the main inspiration for the paintings of Hubert Robert. The beginning painter learned a lot from the Italian master Piranesi, who was then working in Rome. He absorbed the subtleties of the art of painting, watched the life of the city a lot, made many sketches that came in handy when he returned to France. Robert paints the canvas “Artists”, taking as a basis the motive of worshiping the art of antiquity. Italy struck him with incredible contrasts: centuries-old columns and statues side by side with everyday life in a completely natural way. For example, street trade could be located on the background of carved white columns of historical prescription. “Artists” are enthusiastically busy with work. Sitting on the ruins of ancient architectural structures, they contemplate all this wealth of a long dead majestic world. The era that gave birth to philosophers and mathematicians, the wisest thinkers in history, left these testimonies of its once-living flourishing. The wreckage of buildings, huge vases, partially destroyed or extant in the integrity of the sculpture speak of the greatness of human thought, fantasy and skill. Hubert Robert, as a genre landscape painter, wrote a composition on the background of nature. The sky is covered with calm clouds; trees, hillocks and grass fill in empty areas of the web. The approximate year of creation of the masterpiece is 1796. An interesting fact is that the canvas author and his best Roman mentor, Piranesi, were chosen as the models for the two artists. The State Hermitage Museum reliably protects the creation of the painter of ruins, so that all comers at all times can admire the enormous cultural heritage left to the world by ancient Rome.